This microlot is a 100% Castillo varietal, which is more productive and resistant to coffee leaf rust than Caturra. 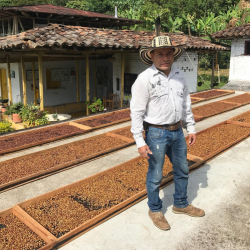 The farmer is Diafanor Ruiz and the cherries were processed after harvest at La Pradera by Cofinet. Cofinet specialise in alternative fermentation processes that are new to Colombia, achieving unique profiles that are unknown for Colombian coffees. Cofinet’s aim is to encourage direct relationships between their farmers at origin, and roasters around the world by creating sustainable, ethical and long-term relationships. As an espresso roast this coffee is full bodied and complex with pear and brown spice flavours. We use express post and only ship freshly roasted coffee so that you can enjoy your coffee when it is at its best. We roast at the beginning of every week and your order will be posted within 24 hours of roasting. Spend $50 and get free Australia-wide delivery, and pay just $10 for delivery of purchases under $50.